As your event approaches you may need to send out important information to your ticket buyers. Our Broadcasts tool allows you to do exactly that. 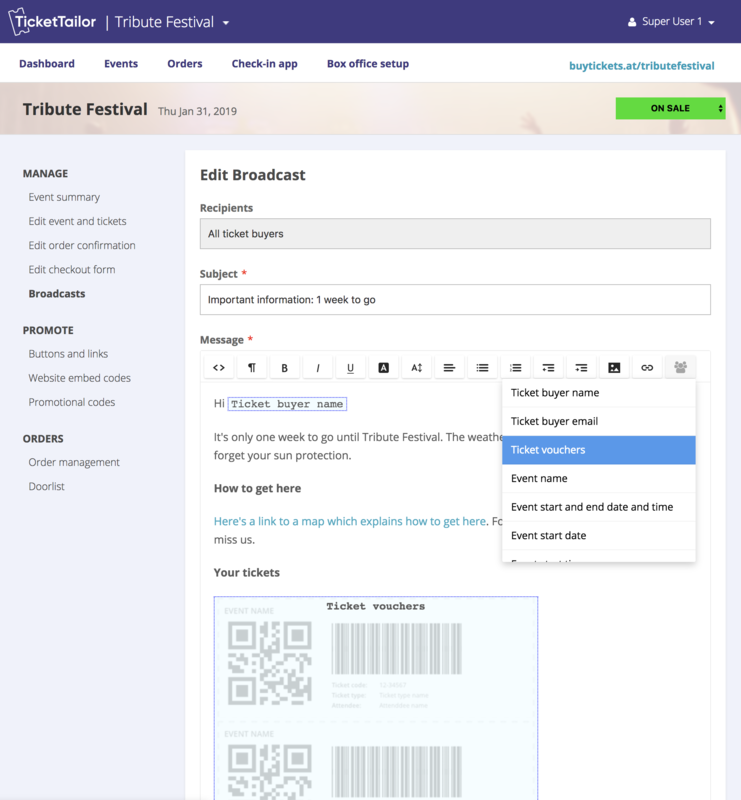 To access Broadcasts, navigate to an event from your Ticket Tailor Admin panel, and select Broadcasts from the left hand navigation. If you don't see Broadcasts then it's because it's invite-only at the moment. To get access simply ask our customer support team to activate it for you. 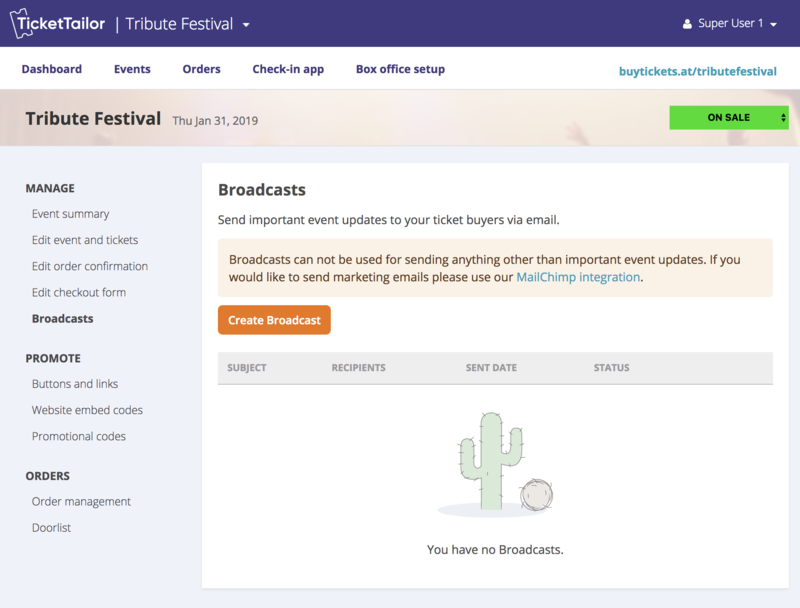 Please note that Broadcasts must not be used for marketing emails, and only for important updates about the event that the ticket buyers have bought tickets for. To get started, click the Create Broadcast button. 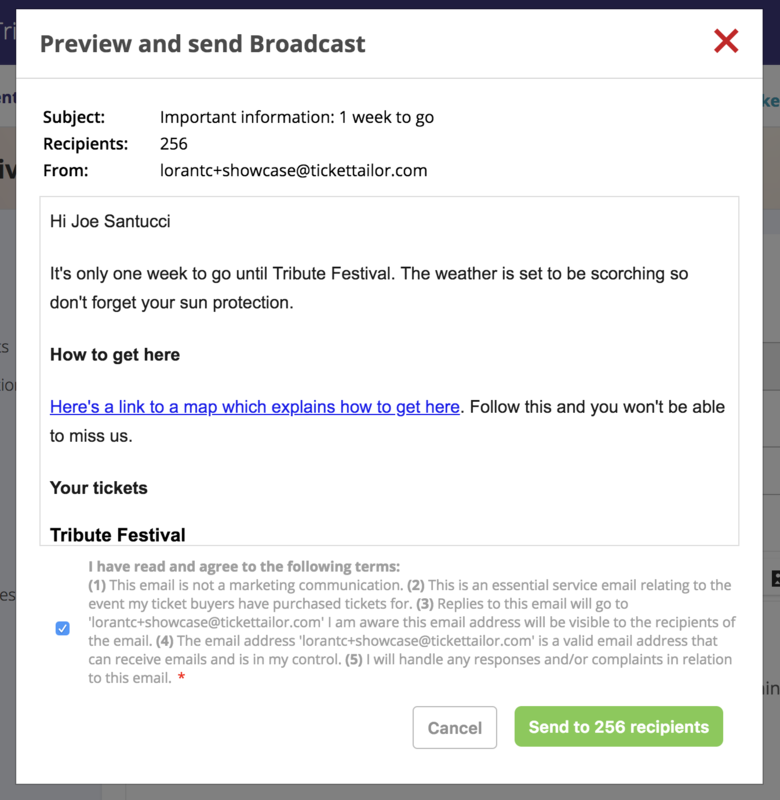 Fill in the Subject and Message with the content you would like to send to your ticket buyers. You can format the message to look however you want using the tools provided and you can add placeholders to personalise the message. For example if you wanted a personalised greeting such as Hi Sarah, click the Insert placeholder button and click Ticket buyer name. 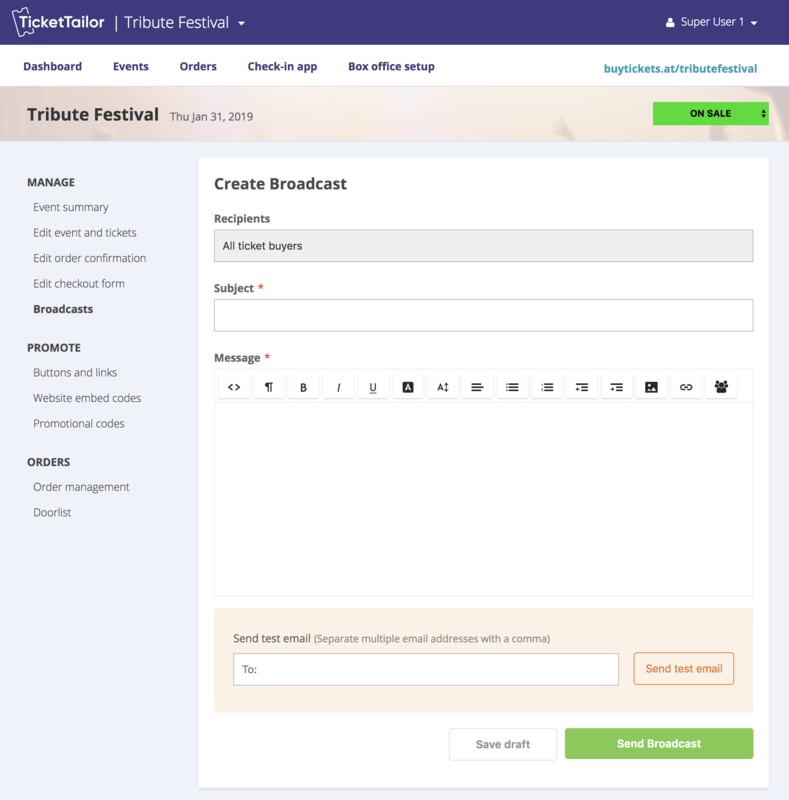 This will add a placeholder to the message that will be replaced by the ticket buyers name. Another example of where personalisation is useful is if you want to resend the ticket vouchers to all of your ticket buyers for convenience. To add ticket vouchers to the message, click Insert placeholder and then click Ticket vouchers. Next you probably want to check that it looks good in the inbox so send a test by entering your email address in the Send test email section and clicking on the Send test email button. It should only take a moment to arrive in your inbox, so check how it looks and make any necessary changes. If you are not ready to send yet, click Save draft and you can come back and send it later. When you are ready to send click the Send Broadcast button. You'll get a quick preview to check it over one final time. Read and tick to agree to the terms and click the Send to X recipients button. That's it. Your Broadcast is now queued for sending and the system will take of the rest. It will usually go out within ten minutes but for large events it may take up to an hour.